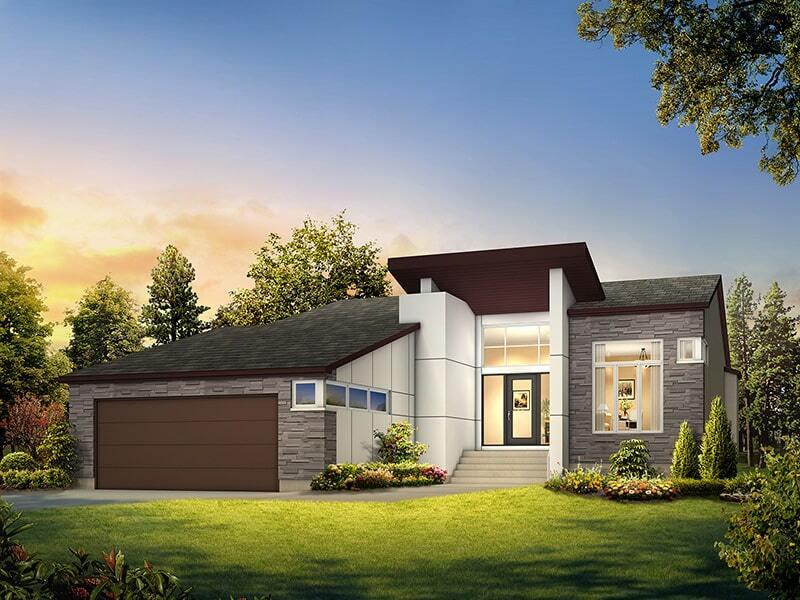 The Avante large bungalow with its 3 bedrooms, 2.5 baths and 12′ ceilings in the great room and foyer will be sure to make you feel like royalty. An open concept floor plan, a double-sided gas fireplace, a built-in 15ft entertainment centre and a developed lower level with bar and media centre are the perfect pieces for all your entertaining needs. The executive kitchen has maple cabinets, quartz counter tops, raised bar island with tiled backsplash and a step-in pantry. Finishes include hardwood and tile flooring, a maple divider with glass panels and chrome spindle railing staircases. The master bedroom features a full walk-in closet and a deluxe ensuite with a 6′ drop-in tiled jetted tub, an enlarged 5ft custom glass tiled shower and double vanities. The exterior of the home has a dominant front entrance with an oversized garage and an abundance of large windows all glistening with a cultured stone and wood finished front elevation. Square Footage: 1,772 sq. ft.